This intriguing disc presents a generous programme of four orchestral works, each clocking in at around 20 minutes, by a pair of decidedly contrasting voices. The performances stem from the June concerts at the State University of New York at Buffalo where Morton Feldman taught from 1971 until his death in 1987. 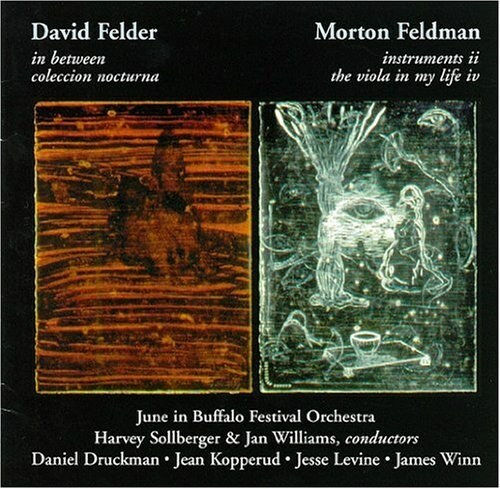 David Felder, a friend and colleague of Feldman's, is professor of composition at SUNY Buffalo and has been artistic director of the June in Buffalo festival since 1985. Though Feldman is the more recognised name, Felder's music is by no means second best. In Between is a wild ride, tearing out fo the gate with high sustained screeches, followed by a brief passage for violins, jagged brass outbursts and tonality-crunching chords. A quiet stalking bass figure emerges as spare notes coalesce and merge around the music. The title refers to the solo percussionist who plays 'in between' the alternately roaring and hushed orchestral tapestry. Powerful brass chords and percussion rattles propel the music to a faster tempo. The wonderfully cacophonous climax, with its wide range of imaginative steel and percussion against roaring brass and pounding bass drum, is reminiscent of the heavy-metal symphonic fury of Cristobal Hallfter. The music is full of incident and never lets up over its 21-minute span, and Daniel Druckman handles the variety of percussion instruments with keen concentration and virtuosic flair. Felder's Coleccion Nocturna pits comparable hair-trigger explosive outbursts against spare piano fragments and roiling, churning orchestral canvas. He often shaves textures down to an atonal honky-tonk piano and gambolling clarinet lines. The churning, roiling music rises to massive crescendos amid soaring jazz-like clarinet descants and saxophone-like wails. This is hugely compelling music played magnificently by the festival orchestra under Harvey Sollberger. Feldman's The Viola in my Life IV offers contrast with the sweet timbre of the solo viola in a melody of neo-Baroque gentility. Distant timpani rolls, percussion rattles and chimes add mystery and context to the viola's foreground dialogue. A three-note bass figure offers material for the soloist's spinning of graceful melodic lines. Feldman's Instruments II is characteristic in its "horizontal" argument with rumbles and spare woodwind notes set against a slowly undulating instrumental canvas. Piano chords and percussion shimmers alternate with wind fragments, and though the music holds one's attention, I can't say this is one of Feldman's more convincing works. All performances are excellent and the superb recording allows the fascinating, variegated sound world of each composer to emerge with maximum clarity and impact.